All Kuvings® juicers come with limited warranty from the date of purchase when utilized for normal and intended household use. If your Kuvings product has a defect in product material within the warranty period, Kuvings Support will repair or replace the defective part. Product model number and serial number are required information to request warranty service. This information can be found on a sticker that is on the bottom or the side of your juicer base. I. NO CONSEQUENTIAL DAMAGES: Kuvings is not responsible for economic loss or special, indirect or consequential including without limitation; loss or damage arising from food or product spoilage claims, whether or not on account of product failure. II. WARRANTY IS NOT TRANSFERABLE: This warranty is not transferable or re-assignable and applies only to the original verified purchaser from an authorized reseller. III. IMPROPER ELECTRICAL CONNECTIONS: Kuvings is not responsible for the repair or replacement of failed or damaged components resulting from electrical power failure, the use of extension cords, low voltage, or voltage drops to the unit. IV. IMPROPER USAGE: Kuvings assumes no liability for parts or labor coverage for component failure or other damages resulting from improper usage or installation or failure to clean and/or maintain the product as set forth in the owner’s manual provided with each unit. 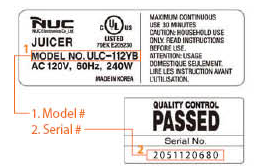 V. CONSEQUENTIAL DAMAGES: This warranty does not cover any defect due to, or resulting from, ordinary wear and tear, handling, abuse, misuse, or harsh chemical action, nor shall it extend to any product from which the serial number has been removed or altered, or modifications made by unauthorized service personnel or damage by flood or fire. VI. OUTSIDE NIGERIA: This warranty does not apply to, and Kuvings is not responsible for, any warranty claims made on products sold or used outside Nigeria. Please complete the form below to register your warranty. On completion we will send you detailed instructions that are important to read. Any questions? call us on +2348037346214.